Welcome back to Outcrop's biweekly round-up of news from the ad and design world. We've had the pleasure of thinking and talking about our own brand identity this week (stayed tuned for updates there), which has got us paying even more attention that usual to great visual branding that really stands out. Take Alexandria Ocasio-Cortez' recent campaign for a Democratic primary in one of New York's congressional districts. 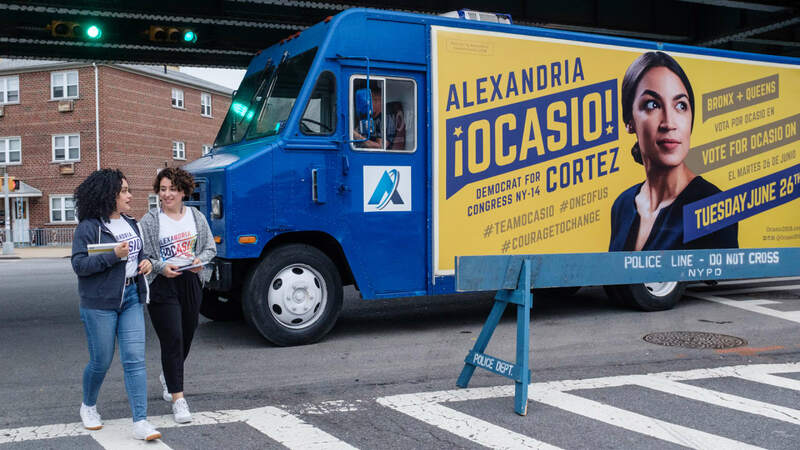 Typically we wouldn't hear much about a congressional primary election, but the 28-year-old Bronx girl's posters were so striking, as was her upset of a 10-term incumbent, that she's been much discussed. Ocasio-Cortez' friend Scott Starrett and his team at Tandem Design NYC came up with the look and feel as an in-kind donation. Starrett told Fast Company they "sought to speak to a different voter base and audience and that required a different visual language." With bold lettering, equally weighted English and Spanish, and slanted text matching Ocasio-Cortez' forward-looking glance, the posters could just as easily have been promoting a new Netflix series. Just goes to show the importance of smart design to better communicate your message and values. Also killing it in the dramatic visuals: KFC. You know we have to stay true to our Northern roots and report on any big fried chicken campaign! KFC Hong Kong's Hot & Spicy outdoor ads, where giant pieces of fried chicken replace bursts of flame, is so simple yet so funny, that it earned them a Cannes Lion in the Outdoor category. Check out the other winners here. If you need to make space on your phone for an ever-growing assortment of time-wasting apps, Instagram has just released an Instagram Lite, at an easy, breezy 573 kb. That's 50x smaller than your standard Instagram. It retains of all Instagram's core features, so if you don't share a lot of video, this might be the app for you! Our next favourite is the "eat like a pro" because what parent/older sibling/baby sitter hasn't encouraged a kid to eat their vegetables by assuring them that's what their heroes eat. That's all from us this week! Did you see any campaigns we should check out? Are you watching the world cup? Are you planning on getting fried chicken this weekend? Seriously, that wasn't even the only KFC ad news this week! Give us a shout on Twitter @outcropcom or Facebook Outcrop Communications.